BOOK NEWS! We got BOOK NEWS! In addition to the piece you see here, we’ve got info on some other new Bronze Age collections DC is putting out. Click here for Legends of the Dark Knight: Steve Englehart, which finally brings his classic run with Marshall Rogers back into print. And click here for Super Friends: Saturday Morning Comics Vol. 1, featuring the ultra-rare Aquateers Meet the Super Friends. DC this August is collecting the classic 1970s Justice Society stories that ran in All-Star Comics and Adventure Comics that not only helped make stars of Power Girl and the Huntress, but featured the landmark death of Earth-Two’s Batman. Jim Aparo cover. Story title? Only Legends Live Forever! 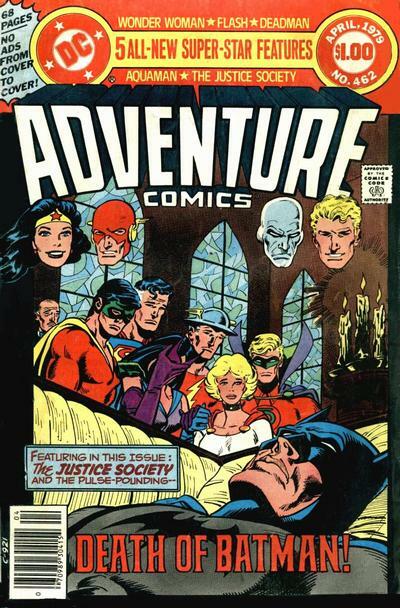 The classic 1970s run of the Justice Society of America is now collected in a single volume from the pages of ALL-STAR COMICS #58-74, ADVENTURE COMICS #461-466 and DC SPECIAL #29! Witness the continuing adventures of the Flash, Green Lantern, Hawkman, Doctor Fate and Wildcat as they’re joined by younger heroes Robin, Power Girl and Star-Spangled Kid to battle the Psycho-Pirate, the immortal Vandal Savage, the Injustice Society and more. Now, this kind of fascinates me. On the face of it, it’s simply great that these first-rate stories are getting collected at all. 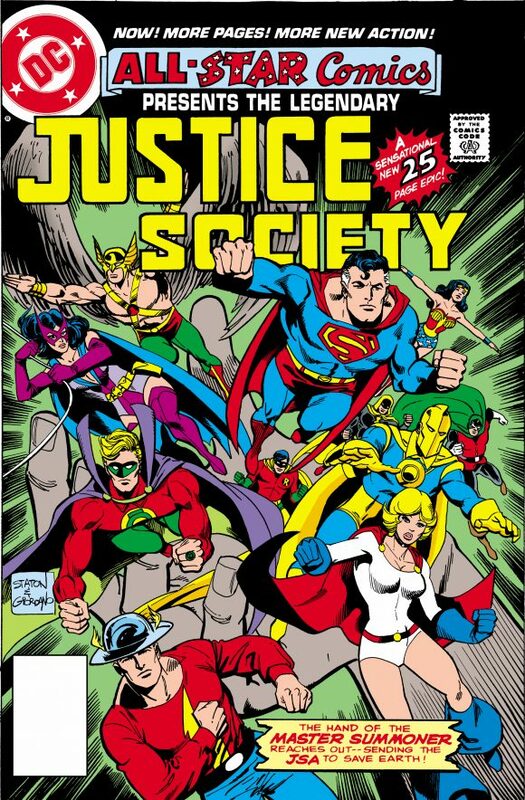 But it also makes me think DC is signaling the Justice Society’s long-awaited return this summer. It’s not uncommon for the big publishers to dip into their back catalogs to capitalize on major events like that and it’s been made abundantly clear that the JSA will re-emerge in Geoff Johns and Gary Frank’s Doomsday Clock – which is expected to end in July. Might a new JSA title be in the offing for late summer or early fall? I’d bet yes. Classics are always fun to reminisce on. Man, DC is determined to break my wallet this summer! It needs to be in hardcover! Great news! I hope they eventually publish All-Star Squadron too. Less exciting than it should be for me, because DC already reprinted those JSA stories in 2 trade paperback collections from August 2006 and February 2007 (both with awesome new covers by Brian Bolland). Since it’s not an oversized hardcover omnibus, I doubt I’ll be buying this just to get all the stories in a single massive 448-page trade collection. They could reprint ALL STAR SQUADRON (which was only collected before in a black & white “Showcase Presents” collection), or the two early ’90s Justice Society mini-series, which have never been collected.